In addition to USB/eSATA external storage devices or remote servers, QNAP Turbo NAS also supports various third party cloud storage services as the backup destination, securing critical data with an additional off-site copy. Choosing a proper third party cloud storage backup service protects the QNAP NAS against unexpected data loss and allows convenient disaster recovery. Scheduled and real-time backup options are provided to meet administration's needs. Data can be easily restored in the event of local file loss or corruption. This greatly ensures data availability. 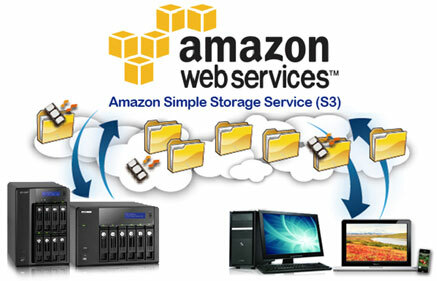 Amazon S3 (Simple Storage Service) is an online storage web service provided by Amazon Web Services. QNAP Turbo NAS supports Amazon S3 to allow users to back up the data from the NAS to Amazon S3, or download the data from Amazon S3 to the NAS anytime. Users can also create scheduled replication jobs for daily, weekly, or monthly backup. ElephantDrive is a service which allows users to perform scheduled and real-time data backup from the QNAP Turbo NAS to ElephantDrive cloud storage. Users can manage the backup tasks and restore the data to the NAS via the web-based management interface (http://www.elephantdrive.com/qnap/). ElephantDrive supports file sharing and versioning. Users can share data securely with anyone and access the files from anywhere over the Internet. Check out the ElephantDrive tutorials to learn how to share files, manage file versioning and archiving preferences, and access the files remotely! Cost-effective: Unlimited storage for free when users contribute to the cloud. Fast: Parallel connections for faster seeding and restore. Secure: patented RAID 96 data protection and AES 256 grade encryption - and data is encrypted before it leaves your site. Easy Data Sync: Securely synchronize all users' critical data directly from the QNAP device to the Symform Cloud for offsite backup and Synchronize critical data across multiple QNAP Turbo NAS or other devices via the Symform cloud for anywhere access and instant restore. More Reliable: 99.9% uptime, SSAE 16 compliance. Start now and get 10GB FREE cloud storage or contribute to the Symform Network and get all your cloud storage for FREE. Go to the Turbo NAS web administration page, click on Cloud Backup and select Symform Tab to register and get started.